How Much Do Cable Railings Cost? Keuka Studios » How Much Do Cable Railings Cost? The most common question we hear from prospective clients is “how much do cable railings cost?” However, unlike many other types of railings, cable railings don’t have a simple price per linear foot. At Keuka Studios, we pride ourselves in our custom metal fabrication and our attention to detail throughout the process. We work closely with our customers to create the perfect railing system for their specific needs. In turn, we price our cable railings based on numerous variables. The size and shape of your project. The material selection of the posts. The material selection of the top rail. The style/design of the posts. The total railing height. Example: 36” vs 42” vs custom height. The diameter of the cable. Example: 1/8” diameter vs 3/16” diameter. To get the most accurate cost estimate for your project, you can send us a drawing with basic dimensions and we will put together a personalized quote. Click here to request a quote today. If you need some ballpark numbers for your project, see the information below. 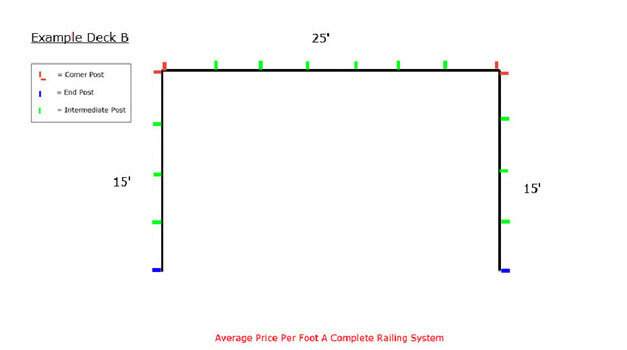 What makes it so difficult to price cable railing by linear foot? First and foremost, the unique shape and size of a deck or staircase dictate the majority a specific project’s cost. Of course, the scale of the project impacts the price of the cable railing; bigger projects require more materials and more time to produce. In addition, we occasionally offer a discount for large-scale projects. How the shape of a railing impacts its price is less straight forward. For example, corners will add cost to your cable railing. As a general rule, the more corners, transitions, and stairs your project as, the higher the cost per linear foot. These elements add to the price because cables should always terminate om 90-degree corners. This means that you will need a termination post, such as an end post or a corner post, along with all the necessary hardware to stop the cables and then start them again in the next direction. Why do we end the cables and not simply bend them around each corner? We stop and start new runs of cable at each corner so the cables maintain proper tension. In order to meet building codes and to provide a safe barrier, a cable railing need to be tensioned correctly. Furthermore, the tension keeps the cables straight. If you try to bend the cables around a corner, they will become loose over time and require frequent maintenance. 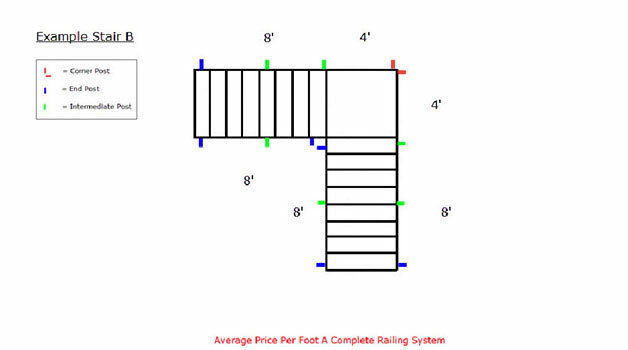 For an example of how shape determines the price of a railing, take a look at these two projects. While we used the same railing design for both projects and they have the same total linear footage, they vary in cost. The more complex a project, the more it costs to design and fabricate the cable railing. 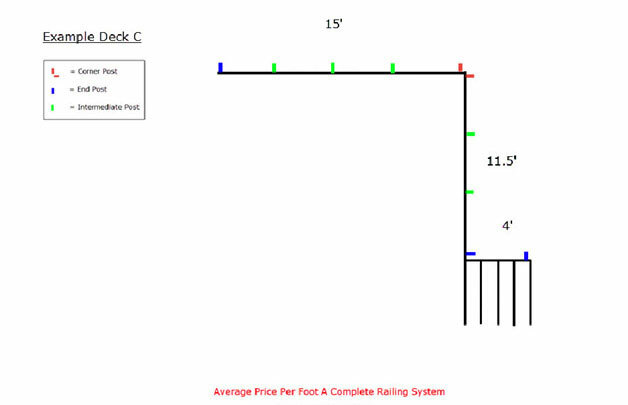 2 Different Deck Railing Layout Patterns: Deck A has lots of corner and end posts. 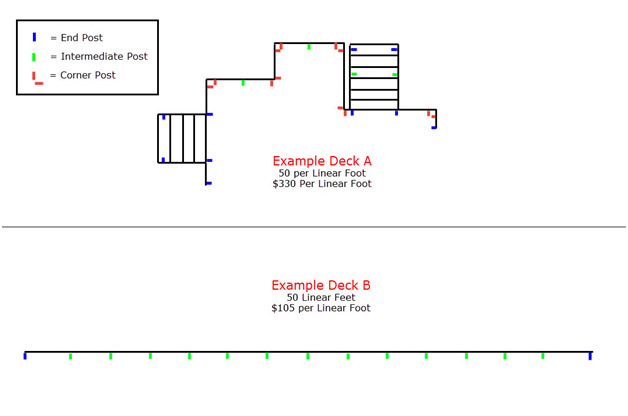 Deck B is cheaper per linear foot because it’s a straight layout and uses fewer posts. In addition, the larger the diameter of a top rail the more it will cost per linear foot. Adding complexity to the top railing will also add to cost. For example, custom profiles and curved top rails will add to the complexity of the rail. At an additional cost, Keuka Studios can also design custom top rails to fit a stair transition. We offer five signature post designs that vary in complexity. Our sleekest and simplest design, the Ithaca Style, takes the least time and materials to construct. In contrast, our Prairie Style posts feature an ornate and unique design. Each post has a herringbone pattern which takes time and precision to create. Thinking of submitting a request for a quote but not sure which cable railing post style you like best? Feel free to request multiple quotes and compare pricing between styles, materials, and finishes. 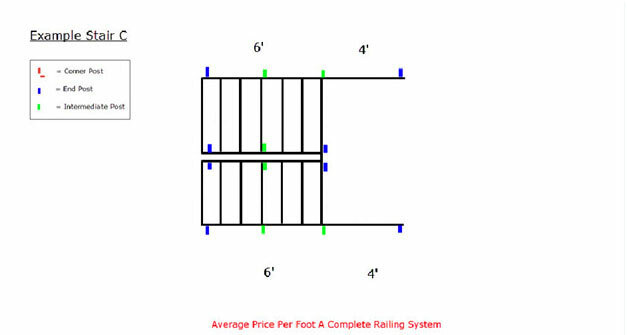 Furthermore, the cable railing height influences the overall cost of the railing per linear foot. Our standard heights are 36” and 42” tall, though we can also make posts with custom heights depending on your local building codes. A standard 36” tall cable railing uses 11 infill cables and a 42” tall cable railing uses 13. In general, you can expect a 42” tall railing to cost approximately 18 percent more per linear foot than a 36” tall railing. A taller post will require more cables, more cable fittings, and additional post material. Lastly, the diameter of the cables used for the railing infill slightly changes the price of the railing. On average, you can expect to spend around $.50 per linear foot for 1/8” diameter stainless steel cable and around $1.00 per linear foot for 3/16” diameter stainless steel cable. Multiply this by 11 cables for a 36” high railing and 13 for a 42” high railing and you can expect to spend $5.50 – $11 or $6.60 – $13 per linear foot for the cable alone. We offer 1/8” stainless steel cable fittings and 3/16” stainless steel cable fittings at the same price. Upon request, we also offer specialty fittings for larger cables, for example, cables with a 1/4” or 5/16” diameter. Tradesman discounts are available. A standard 15% discount is offered to builders and architects and further discounting is available for large projects. Request a quote today for more details. All cable railing projects are subject to a $5,000 minimum order.